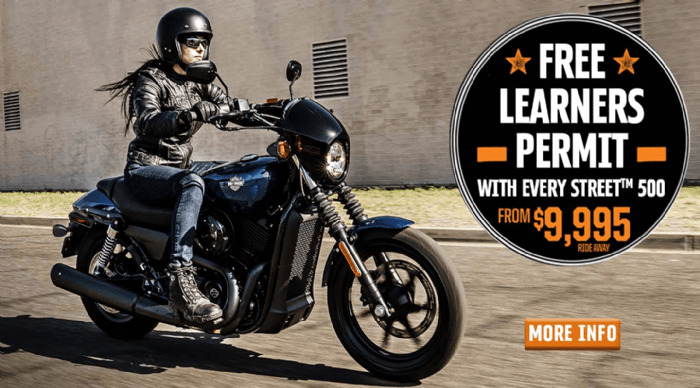 FREE LEARNERS PERMIT with every new Harley-Davidson Street ™500*. We are proud to team up with Quality Motorcycle Training, an awesome local business that offers a range of motorcycle courses including your learner's permit and licence courses. Drop in and see the team and discuss making a Street 500 your next bike of choice or click on our enquiry form if you would like someone to contact you. *This offer will run for a limited time. Please contact the dealership for full terms & conditions.